There has been widespread fear that a geomagnetic storm scheduled for March 18 will wipe out power grids and cause panic. Is it time to prepare for the worst? We can all breathe easy for now. It looks like this threat of grid failure is simply fear mongering. The magnetic storm’s imminent arrival was one of Monday morning’s top science news stories, according to Google News. But the coverage of the storm appeared to be based on a misinterpretation of a chart posted on Russia’s Lebedev Institute’s website showing a minor uptick in geomagnetic activity on the 18th of March. That elevated activity is expected to be a minor storm at most, however. The United States’s NOAA website shows similar readings in their forecast. March 26th also shows similar data to what is anticipated on March 18th. Geomagnetic storms are rated on a scale of G1 to G5, with G5 being the most extreme. On the 18th and the 26th, readings will likely just barely reach the threshold for a G1, which is a minor geomagnetic storm and won’t likely have any real impact on the power grids. G1 storms happen frequently, about 2,000 times every 11 years, or once every two days. This scale is based in part on an index created from the amount of magnetic deviation a storm might produce on the ground combined with measurements of a variety of currents with fabulous names, including the “auroral electrojets” and the “field-aligned current.” The measurement of another type of current is called the “disturbance storm time index,” according to NOAA’s website. “This story [of an imminent power grid failure] is not plausible in any way, shape or form,” Bob Rutledge, who leads NOAA’s Space Weather Forecast Center, told Newsweek via e-mail. 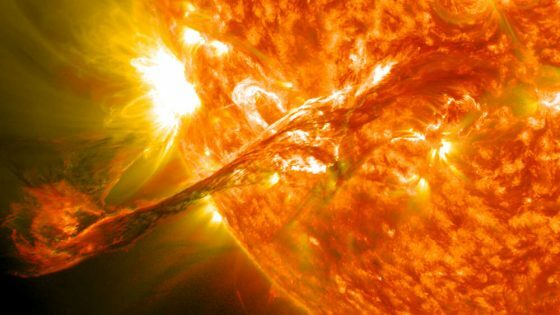 “Things are all quiet for space weather, and the sun is essentially spotless.” According to NASA, our sun is heading toward solar minimum now. Sunspot counts were relatively high in 2014, and now they are sliding toward a low point expected in 2019-2020. Of course, this doesn’t mean preparing for the potentiality of a horrific power grid failure should halt immediately, it’s simply to state that the evidence available doesn’t support a power grid failure on March 18th. A massive geomagnetic storm would be a really big deal for much of humanity. A powerful magnetic storm could cause blackouts and damage communications satellites; it has happened before. One such geomagnetic storm in 1859 shocked telegraph operators and set the paper they were working with on fire, while another in 1989 caused a nine-hour blackout in Canada.